Ask any player about learning guitar and you’ll often hear comments like: “I could never get it in tune,” “My fingers hurt too much,” and “It was hard to play so I just gave up.” Epiphone listened—and the Epiphone PRO-1 Acoustic Collection provides the solution. Drawing on over 140 years of experience, Epiphone luthiers have re-invented the acoustic guitar to create an instrument that’s easy to get started on but sounds so good you’ll keep playing it all your life. Creating a truly easy-to-play guitar wasn’t easy. 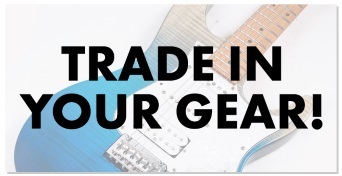 And at Epiphone, we take making a great guitar seriously, no matter what the player’s level. 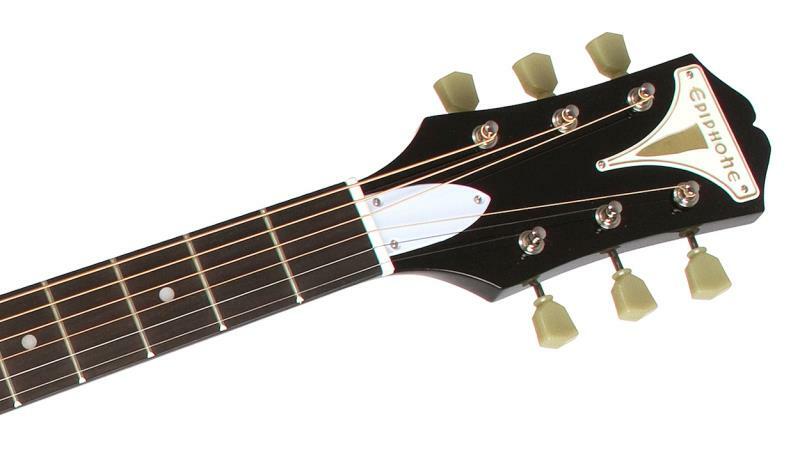 So Epiphone rethought the guitar from top to bottom to make an instrument that anyone can play right away. 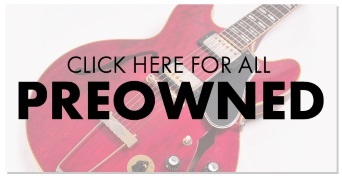 The result is a truly “PRO” guitar that’s easy to play, easy to own, and most importantly, delivers the full, vibrant sound that Epiphone is known for. The PRO-1 acoustic guitar is the result of exhaustive analysis, numerous technological innovations, and suggestions from a “who’s who” of professional players. 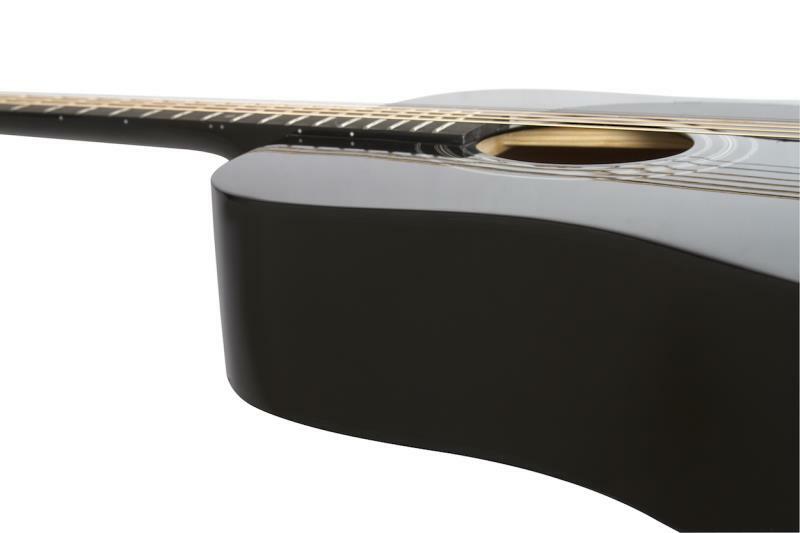 The PRO-1 is a dreadnought style acoustic guitar with a classic profile known for incredible volume and tonal range. While traditional-sized dreadnoughts can be difficult for a new player to get used to, the PRO-1 has a reduced body depth, which makes it easy to hold for long hours of playing. Another Epiphone innovation is the PRO-1’s shorter scale neck with an EZ-Profile™ neck shape, which makes learning chords and licks easier. PRO-Ease™ Lubricant makes the neck feel smooth and “worn in” on your fingers, and JumboPRO™ frets make it easy to hold down Epiphone’s custom light gauge strings. A guitar that plays this easy has to be able to get in tune and stay in tune in a snap. The PRO-1 features Epiphone’s Deluxe tuners, which have 18:1 ratio tuning gears that help make finding the right pitch quick and intuitive. Ordinary tuners have only a 14:1 ratio, which makes fine tuning difficult as the string never quite settles in the right spot. But tuning is easy with the PRO-1’s higher gear ratio which lets you adjust your tuning with greater precision so it’s easier to find the right pitch and stay there. The PRO 1’s new EZ-String™ Rosewood bridge doesn’t use bridge pins which on other guitars are difficult to remove and difficult to get in place (not to mention easy to lose!). So changing a string and getting it in tune on the PRO-1 is fast and easy. The PRO-1 includes a Sound Hole Humidifier to protect your precision instrument from moisture and environmental changes, a Tips and Tricks Book with tips on getting the most from your guitar, and free online lessons from eMedia.